Craving Japanese? How about some all-you-can-eat tempura? (SPOT.ph) What are your taste buds in the mood for this week? In case you want to unwind, we're down to the home stretch of Oktoberfest, so you can take advantage of a few more beer promos. We also found unlimited wings, two-for-one pretzels, and more. Plus, Amici and Buffalo's Wings N' Things are celebrating their birthdays with a bang! 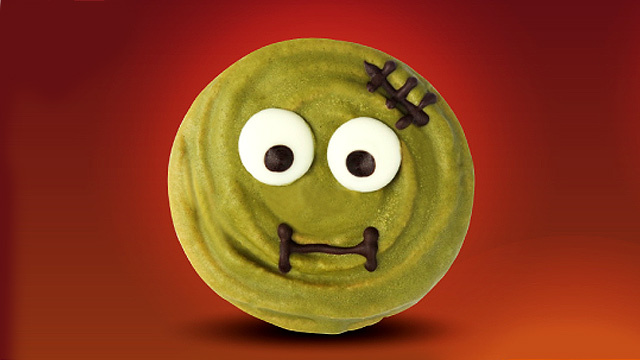 Get ready to eat all the snacks that you can get your hands on at Tempura! 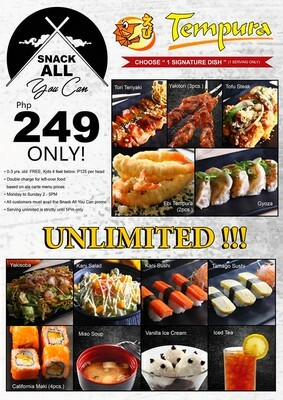 For just P249, you get to enjoy a single serving of a signature dish and then unlimited sides, which include Yakisoba, Kani Salad, Kani Sushi, Tamago Sushi, California Maki, Miso Soup, Vanilla Ice Cream, and Iced Tea. This promo is available daily from 2 p.m. to 5 p.m. or the entire day, depending on the branch. See a list of Tempura branches. For more information, log on to Tempura’s Facebook page. Lunch is served! 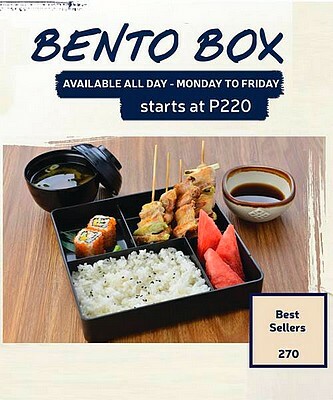 Get Japanese vibes when you eat with Nanbantei of Tokyo’s Yakitori Bento. This promo is available all day from Monday to Friday at the Alabang Town Center branch. Prices start at P220. Nanbantei of Tokyo is at Corte de Las Palmas, Alabang Town Center, Filinvest City, Muntinlupa City. For more information, log on to Nanbantei of Tokyo’s Facebook page. It's time to dine, drink, and be merry at Draft for Oktoberfest. 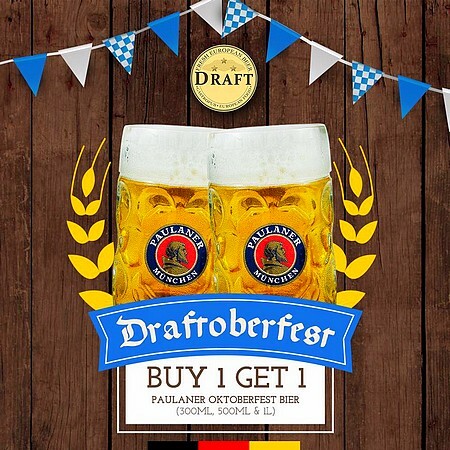 Treat yourself to the buy-one-take-one promo on Paulaner Oktoberfest Beer. It’s available all day and all night until November 17. See a list of Draft branches. For more information, log on to Draft's Facebook page. Wednesdays are Wings Day at Burger Garage! Get ready to get your hands dirty with their unlimited chicken wings promo for only P299, which already comes with unlimited rice. Choose among these irresistible flavors: Sriracha, Garlic Parmesan, Barbecue, Classic Buffalo, Chipotle, and Overheat. This promo is valid every Wednesday until November 8. Burger Garage is at 1121 Rodriguez Avenue, Bangkal, Makati City. For more information, log on to Burger Garage’s Facebook page. 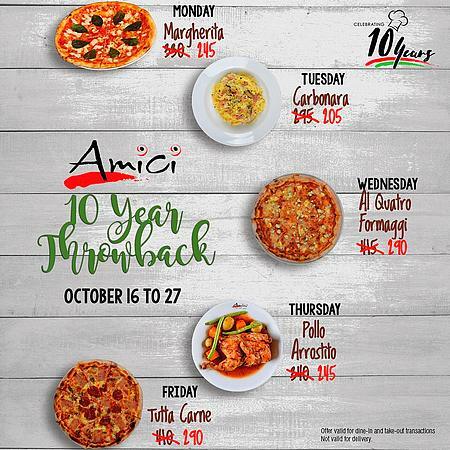 Amici is celebrating 10 years with the ultimate throwback! Dig into your favorite meals with prices from 10 years ago. Until October 27, some bestsellers are back to their original prices: Margherita Pizza at P245, Carbonara at P205, Al Quatro Formaggi Pizza at P290, Pollo Arrostito at P245, and Tutta Carne at P290. See a list of Amici branches. For more information, log on to Amici’s Facebook page. Time to gather everyone for a pizza party! 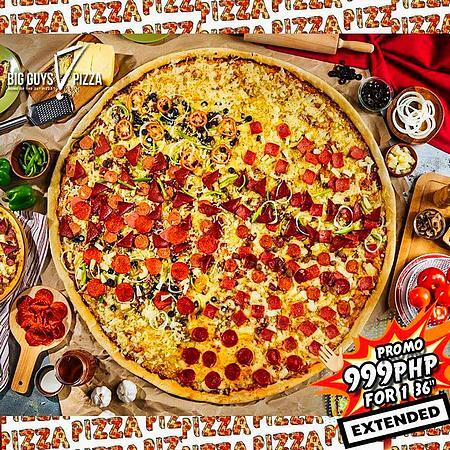 For the entire month of October, BIG Guys is offering its 36-inch pizza for just P999. It's good for 15 to 20 people with at least 70 slices! See a list of BIG Guys branches. For more information, log on to BIG Guys' Facebook page. Saturdays are meant for unwinding and letting loose! Head over to Taqueria 101 with the gang and celebrate the weekend over cervezas and fritas. 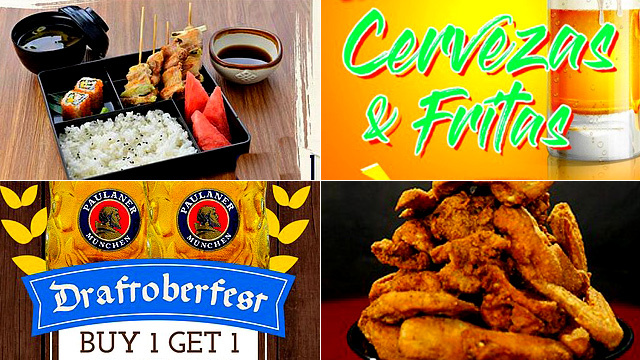 For just P650, enjoy six bottles of beer (or six mojitos), six nacho wings, and six-piece Spam fries. 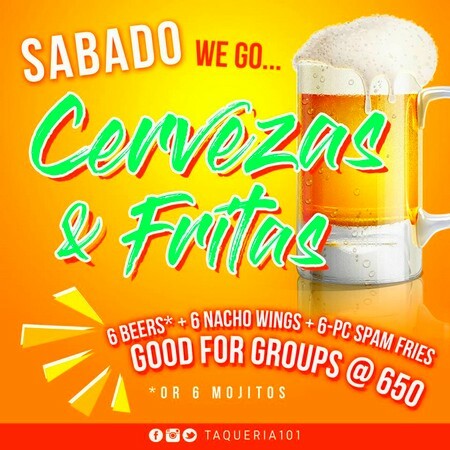 Taqueria 101 is at 101 Doña Soledad Avenue, Better Living Subdivision, Parañaque City. For more information, log on to Taqueria 101's Facebook page. It’s back! 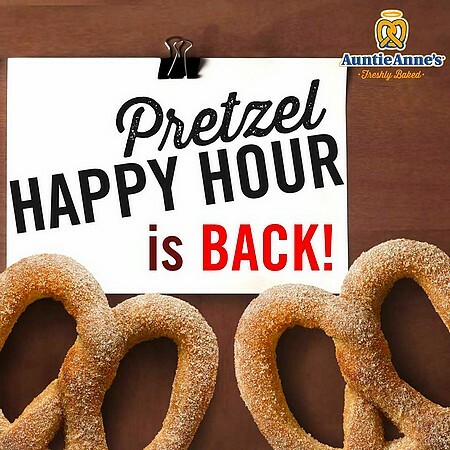 Auntie Anne’s Happy Hour promo is available again for your sweet cravings. Buy one pretzel and get another one for free. This offer is available from Monday to Wednesday until November 15, from 12 p.m. to 2 p.m.
See a list of participating Auntie Anne's branches. For more information, log on to Auntie Anne's Facebook page. Double the treat! Grab a Fresh Pack and have a cookie to go along with it—for free! 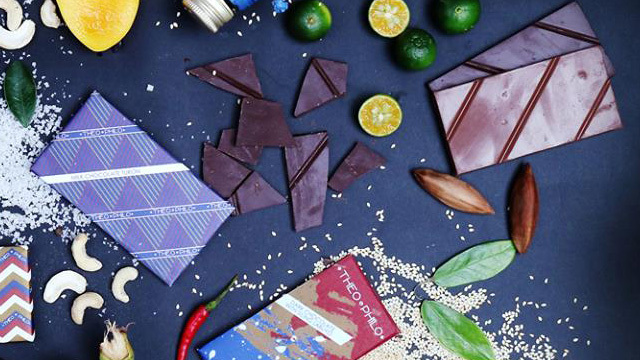 It’s going to be a party for your sweet tooth. Promo is running until November 30. See a list of Baskin-Robbins branches. 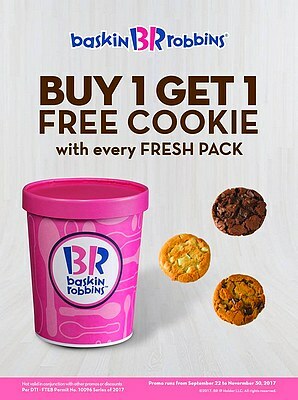 For more information, log on to Baskin-Robbins' Facebook page. Join the celebration of Buffalo's Wings N' Things' third anniversary! Only on October 24, dig into your favorite Buffalo wings for P3. All you have to do is order a half-pound of Champion Buffalo Wings to score another half-pound for just three bucks. 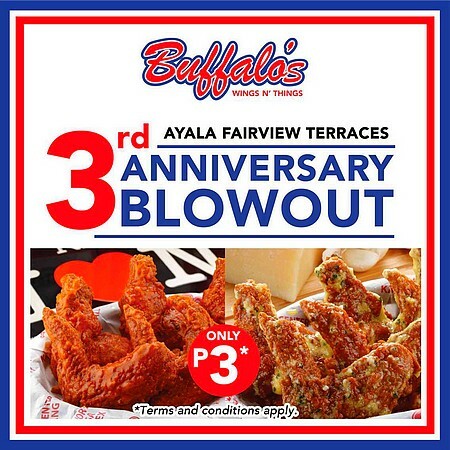 This awesome, one-day-only offer is valid for dine-in transactions at the Ayala Fairview Terraces branch. Buffalo’s Wings N’ Things is at 2/F Central Garden, Ayala Fairview Terraces, Maligaya Road corner Quirino Highway, Novaliches, Quezon City. 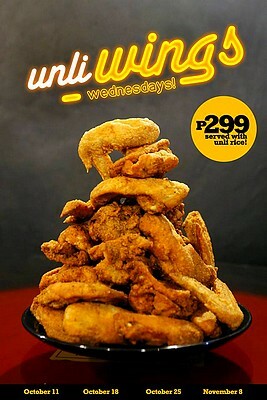 For more information, log on to Buffalo’s Wings N' Things' Facebook page.